One colleague of mine in Dauphine gave me Anathem to read a few weeks ago. I had seen it in a bookstore once and planned to read it, so this was a perfect opportunity. I read through it slowly at first and then with more and more eagerness as the story built on, spending a fair chunk of the past evenings (and Metro rides) into finishing it. 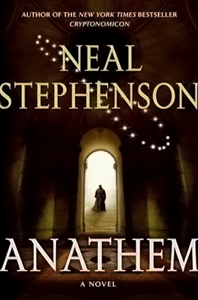 Anathem is a wonderful book, especially for mathematicians, and while it could still qualify as a science-fiction book, it blurs the frontiers between the genres of science-fiction, speculative fiction, documentary writings and epistemology… Just imagine any other sci’fi’ book being reviewed in Nature! Still, the book was awarded the 2009 Locus SF Award. So it has true sci’fi’ characteristics, including Clarke-ian bouts of space opera with a Rama-like vessel popping out of nowhere. But this is not the main feature that makes Anathem so unique and fascinating.